VMware have just released PowerCLI 5.1 R2 and with it are the long awaiting cmdlets to work with VDS! I worked with these a little and although VDS are not 100% fully covered in this release the cmdlets are certainly useful for most of the things I needed to do and they opened up VDS with the .extensiondata property for the rest of the things I wanted to play with. Two of the cooler cmdlets where the Export-VDSwitch and New-VDSwitch –backupfile which can be used with 5.1 and the new VDS features to backup the VDS into a simple zip file and re-import it when needed. I have included the new cmdlets and some examples from the help file below. As well as the VDS cmdlets I am also happy that VMware now supports PowerShell v3 and vCloud Director 5.1 in both their admin version of PowerCLI and their Tenant version, this opens up vCD to automate some of the cooler new features of VCD and also enable the enhancements made by Microsoft in PowerShell v3. Retrieves the specified physical network adapter from the specified host and adds it to the specified distributed switch. Adds two hosts to the specified distributed switch. Get-VDSwitch -Name "MyDistributedSwitch" | Add-VDSwitchVMHost -VMHost "VMHost1", "VMHost2"
Exports the configuration of the specified port group to the specified file. Exports the configuration of the specified port group to the specified file. If the MyVDSwitchesBackup directory does not exist, it is created. If the MyVDPortGroupBackup.zip file already exists in the specified location, it is overwritten. Get-VDSwitch -Name 'MyVDSwitch' | Export-VDSwitch -Description "My VDSwitch configuration" -Location "c:\myVDSwitchConfig.zip"
Retrieves the distributed port group named “MyVDPortGroup” on the specified vSphere distributed switch. Get-VDPortGroup -Name "MyVDPortGroup" -VDSwitch "MyVDSwitch"
Retrieves the distributed port groups that are related to the specified organization network in the cloud. Retrieves the distributed port group to which the specified virtual machine network adapter is connected. Retrieves all vSphere distributed switches in the specified datacenter. 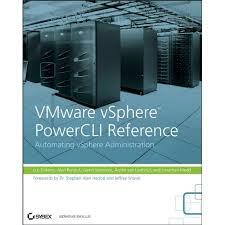 Retrieves all vSphere distributed switches to which the specified host is added. Retrieves all vSphere distributed switches to which the specified virtual machine is connected. Creates a new distributed port group on the specified vSphere distributed switch with the specified number of ports and VLAN ID. Creates a new distributed port group on the specified vSphere distributed switch by cloning the configuration of the distributed port group named “MyReferencePortGroup”. $myReferncePortroup = Get-VDPortgroup -Name "MyReferencePortGroup"
Creates asynchronously a new distributed port group on the specified vSphere distributed switch. Creates a new distributed port group on the specified vSphere distributed switch by importing the specified backup profile. Creates a new distributed port group on the specified vSphere distributed switch with the specified name and VLAN trunk range settings. Get-VDSwitch -Name "MyVDSwitch" | New-VDPortgroup -Name "MyVDPortGroup" -VlanTrunkRange "1-5, 10-20"
Creates a new vSphere distributed switch with the specified name, version, maximum number of ports, and link discovery protocol settings in the specified datacenter. New-VDSwitch -Name "MyVDSwitch" -Location $myDatacenter -LinkDiscoveryProtocol "LLDP" -LinkDiscoveryProtocolOperation "Listen" -MaxPorts 256 -Version "5.0.0"
Creates a new vSphere distributed switch by cloning the configuration of the existing distributed switch named “MyReferenceSwitch”. The new distributed switch is created without cloning the existing port groups and is stored in the specified folder. $myFolder = Get-Folder -Name "MyFolder"
Creates a new vSphere distributed switch by importing the specified backup profile. New-VDSwitch -Name "MyVDSwitch" -Location $myFolder -WithoutPortGroups -BackupPath "c:\MyDistributedSwitchProfile.zip"
Removes the specified distributed switch. Removes the specified host physical network adapter from the distributed switch that it is connected to. Removes two hosts from the specified distributed switch. Get-VDSwitch -Name "MySwitch" | Remove-VDSwitchVMHost -VMHost "VMHost1", "VMHost2"
Changes the name, number of ports and the VLAN ID of all distributed port groups named “MyVDPortGroup”. Changes the VLAN trunk range of all distributed port groups named “MyVDPortGroup”. Get-VDPortgroup -Name "MyVDPortGroup" | Set-VDPortgroup -VlanTrunkRange "1-5, 8-10"
Sets the VLAN type of the specified distributed port group to None. $myVDPortgroup = Get-VDPortgroup -Name "MyVDPortGroup" -VDSwitch "MyVDSwitch"
Rollbacks the configuration of all distributed port groups named “MyVDPortGroup”. Reconfigures all distributed port groups named “MyVDPortGroup” by importing the configuration from the specified backup profile. Modifies the maximum number of ports, the number of uplink ports, and the maximum MTU size of the specified vSphere distributed switch. Changes the version of all vSphere distributed switches whose names start with “MyVDSwitch”. Enables link discovery protocol on the specified vSphere distributed switch, sets it to LLDP and changes the link discovery protocol operation to listen. Reconfigures the specified vSphere distributed switch by importing the specified backup profile. The original port groups are not recreated. Rollbacks the configuration of the specified vSphere distributed switch to its previous state.